We are a leading Exporter of tube heater, industrial tube heaters and dryer heater from Chennai, India. tubular type any industrial heaters for higher temperature and specific heat temperature application. Our company is instrumental in manufacturing and supplying an excellent quality Dryer Heater. Widely demanded power plants, chemical, petrochemical, refineries, natural gas processing, and many more industries, this exchanger is used for efficient heat transfer from one medium to another. Heat exchanger provided by us is manufactured from the premium quality components that we procured from the genuine vendors of the market and advance technology in compliance with industry set standards. 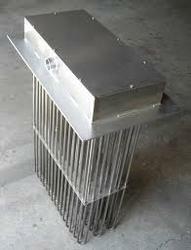 Apart from this, we provide this well tested heat exchanger in customized options at affordable prices. Looking for Tube heaters ?